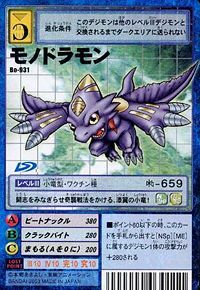 A Small Dragon Digimon that has bat-like wings attached to its hands, but is unable to fly. 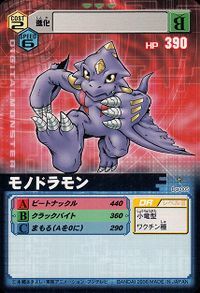 Despite being a Vaccine, its personality is not so much considerably rough as it is near to brutality, giving the impression that it is a brawl-loving Digimon. Even in the Digital World, this Monodramon is in the heart of most brawls enough that it seems even Orgemon is fed up with Monodramon’s tenacity. Also, the horn extending behind it is said to be its weak point, but how true this is is uncertain. Its Signature Move is fragmenting the data of the area it bites, and based on the area the opponent was bitten, they collapse into malfunction (Crack Bite). Its Special Move "Beat Knuckle" is a simple bold move in which it said to assault with earth-shattering force, and wallop with its powerful claws. | Mono 「モノ」 means one, referring to the single horn on Monodramon's head. 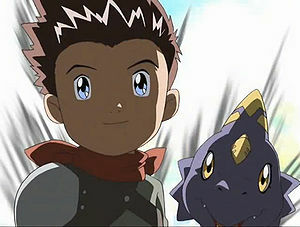 Anime/Manga Digimon Tamers: "The Return to the Real World!" 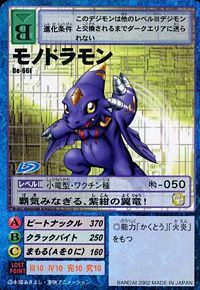 Beat Knuckle  ビートナックル Bīto Nakkuru Beat Nuckle/Knuckle Beater Charges at the foe, attacking with its claws. Monodramon is the partner of Akiyama Ryo. Monodramon is teamed up with Akiyama Ryo in the prehistoric Digital World by ENIAC. 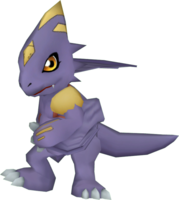 Special event character and can evolve to Devidramon at 21. 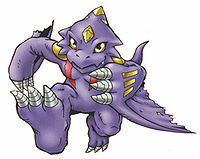 Evolves from Chicomon at Level 15 with 300 Dragon EXP. 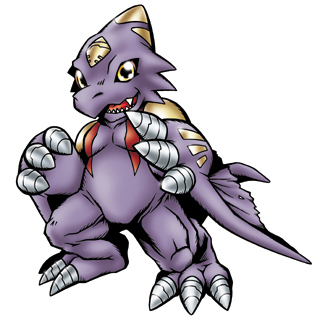 Monodramon can evolve to Dinohumon at Level 24 with 900 Dragon EXP or to Aidramon at level 21. 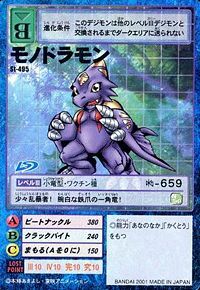 Monodramon is only obtainable as a collectible card. 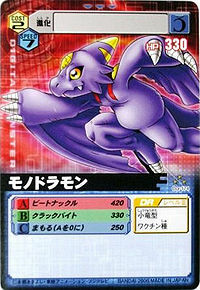 Its card is part of the Heroes of Justice (正義のヒーロー Seigi no Hīrō) set. 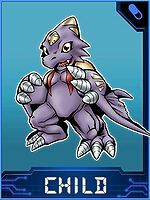 Monodramon is available as a Digimon Medal. 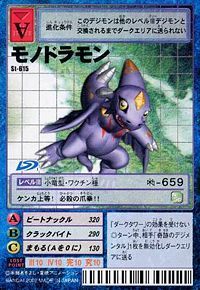 Monodramon is available as a Digimon Card. It can get rather thuggish! This mischievous one-horned dragon is armed with metallic claws! Bring it on! It attacks with its clawed fists!! 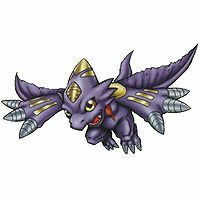 Overflowing with fighting spirit, this small, black-winged dragon launches its ambush battle tactics! An indigo winged dragon who is full of ambitions! 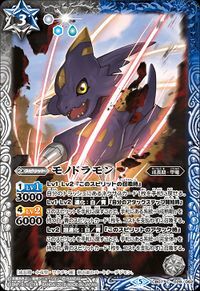 Illustration for the Battle Spirits Collaboration Booster: Digimon - Settle it! Card Slash! This page was last modified on 6 January 2019, at 18:15.